Region: Central part of Mongolia. Thank you for your friendly, fun and professional attitude. We had a blast! Listening to Mongolian music during the drive definitely added to the mood and experience. The wild horses were amazing and we took so many photos, it was so hard to choose the ones we wanted to print out for our photo album. Ride Yamaha, BMW and KTM motorcycles across in Gobi Desert. 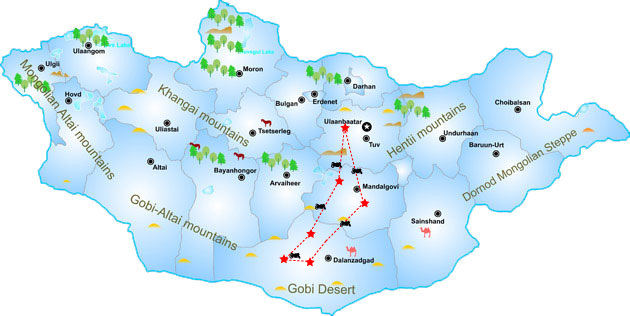 See some of the most amazing sights and geographical formations that this country has to offer, including big granite mountains with bizarre rock formations, pink and white colored limestone cliffs weathered by wind and rain, golden sand dunes 180 km long and a cold mountain canyon up in the Gobi mountains. Meet families leading the ancient nomadic lifestyle and have a chance to experience their fascinating culture. Drive to Ulaanbaatar. Transfer to the hotel and lunch at the finest restaurant in Ulaanbaatar. In the afternoon free time do shopping for cashmere shop, souvenir shop and State Department Store. Enjoy watch national folklore performance by “Tumen Ekh” national song, throat singing, tsam mask dance and so on. A farewell dinner and stay overnight in hotel. Motor cycles are Yamaha 250 and 450, BMW and KTM.